Thomas Reilly Collection. Tony Jannus in Russia, 1916. Transcribed by Bob Davis - 11-16-03 "Washington - Miss Laura Merriam's heroine aspirations do not end with flights in aeroplanes. 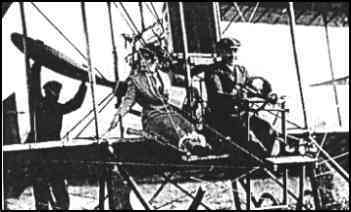 Miss Merriam went for a trip through the air with Antony Janus, who also carried Miss Dorothy Williams at the same time. Now that Miss Merriam has had a taste of high flying she declares if there is a war with Mexico she will undertake a more sober task and enlist as a nurse. Her declaration has set a number of other girls to thinking, and if the army in Texas gets word of it there can be no doubt that war will be immediately declared. Miss Merriam is one of the leaders of the younger set at the capital and is the daughter of W. R. Merriam, formerly governor of Minnesota. She is a daring cross country rider and has little fear of anything, because, she declares, she is a fatalist." GREAT LAKES RELIABILITY CRUISE, 1913 Not until 1913 was sufficient interest aroused in the United States to warrant a contest for water craft. Under the auspices of Aero & Hydro, a Great Lakes "Reliability Cruise" was organized for the week of July 8 -- the course to follow the shoreline from Chicago to Detroit via the Straits of Mackinac. It was heralded as the biggest competitive aerial event for the year. Most of the pilots who had taken up the practice of flying over water were on the entry list -- a total of fifteen names. John B.R. Verplanck, an affluent sportsman from the Hudson River Valley, and his seasoned pilot, Beckwith Havens, entered a Curtiss flying boat with 90-hp Curtiss motor -- as did Charles C. Witmer, Jack Vilas, G.M. Hecksher, and Navy Lieutenant John H. Towers. Antony Jannus,Hugh Robinson, and Tom Benoist entered Benoist flying boats, each with a Hall-Scott motor of 100 hp. MANHATTAN AERIAL DERBY, 1913 In an effort to get away from stunting by reviving the sporting aspects of aviation, the New York Times sponsored. on October 13, 1913, an aerial derby around Manhattan, in conjunction with a meet arranged by the Aeronautical Socieity of New York at Oakwood Heights, Staten Island. The course was clear enough: from Oakwood Heights around Manhattan and back again to Staten Island. For safety's sake, each flyer was required to wear a life preserver (an inflated inner tube would do) and to carry a map showing the route and the control points. As a further precaution, it was stipulated that the race be flown at an altitude of not less than 2,000 feet, to allow for an emergency landing elsewhere than on the housetops of New York. Of the nine entrants, Last to ascend was Antony Jannus -- No. 9 on the list -- who had shipped his Benoist biplane with 75-hp Roberts motor all the way from St. Louis for the contest. The Benoist was not a fast machine, but it flew surely and steadily in a wind; and the experienced Jannus, well known for his repeated assaults on American records, commanded plenty of respect. FIRST AIR LINE FLIGHT, 1914 "The New Year's Day flight by Tony Jannus on January, 1, 1914, was the first scheduled airline flight with a passenger and started him on a career carrying passengers across the Tampa Bay. 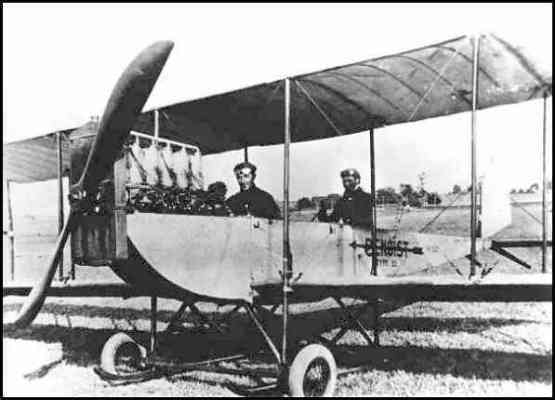 Jannus used a Benoist biplane seaplane in the flight from St. Petersburg to Tampa, Florida. It was reported that he flew at a height of 15 feet on his trips across the bay." The anniversary of the flight has been celebrated in St. Petersburg and Tampa for many years and various aircraft have been used to commemorate the original flight. A few years ago, however, the Florida Aviation Historical Society undertook the construction of an accurate replica of the Benoist, with a target date of January 1, 1984 for completion -- the 75th anniversary of Jannus' 1914 adventure. Tony Jannus & Albert Berry "Aviation history again was made over the CIty of Flight on March 1, 1912, when Capt. 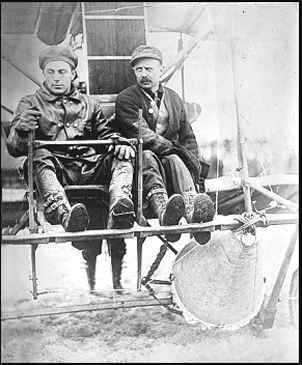 Albert Berry, right, made the first parachute jump from an airplane. The Benoist biplane, piloted by Tony Jannus. The parachute was carried in the cone-like device in the undercarriage, held in by rubber bands which broke under the weight of the jumper." Tony Jannus died on October 12, 1916 at the age of 27 when the Curtiss H-7 he was testing for the Russians had engine trouble and crashed into the Black Sea. His body was never found. 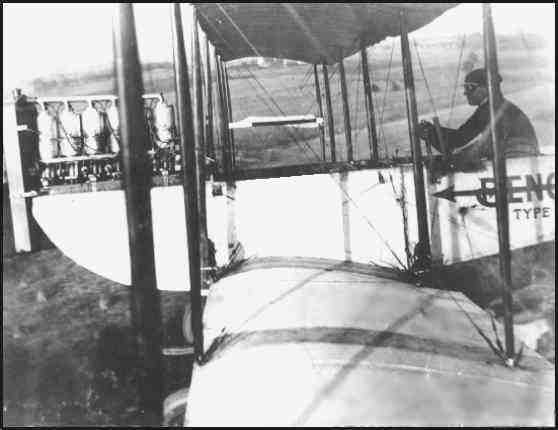 Tony Jannus at the controls of a Benoist, 1913. Tony Jannus at the controls of the Rex Smith biplane, Potomac Park, Washington, D.C., 1911. 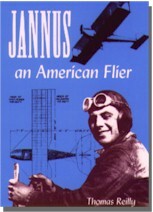 "Jannus, an American Flier recounts the life and exploits of one of the forgotten figures of early aviation, a colleague of Curtiss and Benoist who pioneered in military and commercial aviation but died early and was all but lost amid the high-speed developments of the industry. Reilly's account will appeal to aviation historians in particular and to the many general readers interested in the pioneer era of flight." ---Louis S. Casey, curator, National Air and Space Museum, Smithsonian Institution. Thomas Reilly presents the first complete account of one of America's aviation pioneers. Tony Jannus was a barnstormer, a test pilot, and a youthful, magnetic personality in aviation's early days of daredevils and adventurers. Reilly follows Jannus's exploits from his early flights at College Park, Maryland in 1910, through the first tests of airborne machine guns and parachutes, his record-setting flight from Omaha to New Orleans, to his role in the world's first airline, his career as a test pilot, and his premature death in Russia's Black Sea while delivering bombers to the Romanov government. Figuring prominently in the story are Jannus's relationships with fellow pioneers of the aviation industry such as Glenn Curtiss, Thomas Benoist and Katherine Stinson. Beyond headlines and records, Reilly introduces us to Jannus the man. Though others might have owned or designed the planes, Jannus was always the center of attention. His personality, good looks, and talent as a speaker made him a popular figure. He dated movie actresses, and women idolized him, though his gifts as the epitome of the romantic flyer led to a bitter break with Tom Benoist and eventually to his "banishment" to Russia by Glenn Curtiss. Drawing on decades of articles and books about the early aviators as well as FBI files, court cases against the Curtiss Company, hundreds of letters between Jannus and his contemporaries, and materials in the Russian archives, Reilly has composed a fascinating portrait of a compelling, romantic figure from the dawn of American aviation. Thomas Reilly is an aviation consultant with 25 years of experience as chief financial officer for several airlines. He has served as curator for a number of exhibitions on aviation---most notably the Tuskegee Airmen---and has written many articles on aviation for Airline Pilot, Atlantic Flyer, and the Journal of the American Aviation Historical Society. December, 240 pp. 6 X 9.